Pottery has a sensuality to it, a physical and emotional feel. The quality of the pottery indicates a lot about the maturity and prosperity of the culture that developed it. When times are good, pottery develops many different styles and forms. Decorations on the pottery also develop and proliferate. When times are not so good we see less pottery. Sometimes we also see the merging of different lines, such as when many Hopi migrated to Zuni in the late 1800's to wait out a drought and a smallpox outbreak in their homeland. When the Hopi returned to their mesas, the potters brought the use of the Zuni white slip with them. Contrary to many other art forms, pottery is something you can pick up and feel with your hands. If you are really sensitive and in tune, you can often feel the energy of the potter who made it... It's a phenomenon I especially see when "in tune" people touch pieces made by Nampeyo of Hano. I've seen it with pieces made by other potters, too, but I have seen the phenomenon most pronounced with Nampeyo's pottery. For that matter, when working to ascertain who really created any older Hopi piece we have achieved the best results by asking descendants of various Hopi potters to offer their opinions: first thing they do is touch the piece, then run their hands over it, then examine the decorations. I've seen them identify the maker of the pot, the decorator of the pot, the relationships among the family involved and even who someone learned from, why they learned and where, exactly, in the neighborhood they lived at the time... and this is on pottery made 100 and more years ago. Native American pottery has a legacy dating back at least 3,500 years. It's still a mystery as to how someone discovered that clay, when heated to a high enough temperature, would transform into a solid, brittle object that holds its shape. 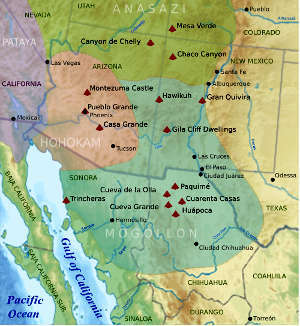 Some scholars claim the technique was brought to the early Southwest by settlers from Mesoamerica. 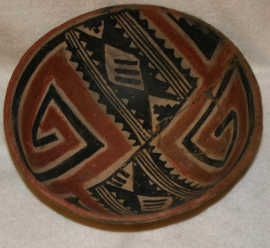 Others contend that pottery making originated independently in the Southwestern cultures. One possibility for the discovery of the technique is that early cultures lined their cooking baskets with soft mud that would dry and harden and create a better and more durable surface on which to cook. The archaeological record somewhat supports this theory as early vessels have been found with the imprint of woven baskets texturing their outer surfaces. Rodents can gnaw through a storage basket and quickly destroy any seeds or meals stored inside. A truly “hard” basket would stop that. A "hard" basket could also be coated with pitch just like a “soft” one, and become waterproof (Southwestern Native American pottery still is not normally glazed and will not hold a liquid without some such inner coating). A "hard" basket made for much more efficient cooking than a soft one. The idea was revolutionary and we can be sure it was opposed by those who made their living making and "selling" baskets. However, a "hard" basket can also crack or shatter. This trait made ceramic pottery a luxury to be enjoyed primarily by a sedentary culture. The nomadic cultures of the Great Plains and the semi-nomadic Navajo, Ute and Apache of the Southwest never made much pottery, although some Navajo potters today are creating some beautiful pottery, sealing it like they would a basket using the ancient pine pitch covering technique. 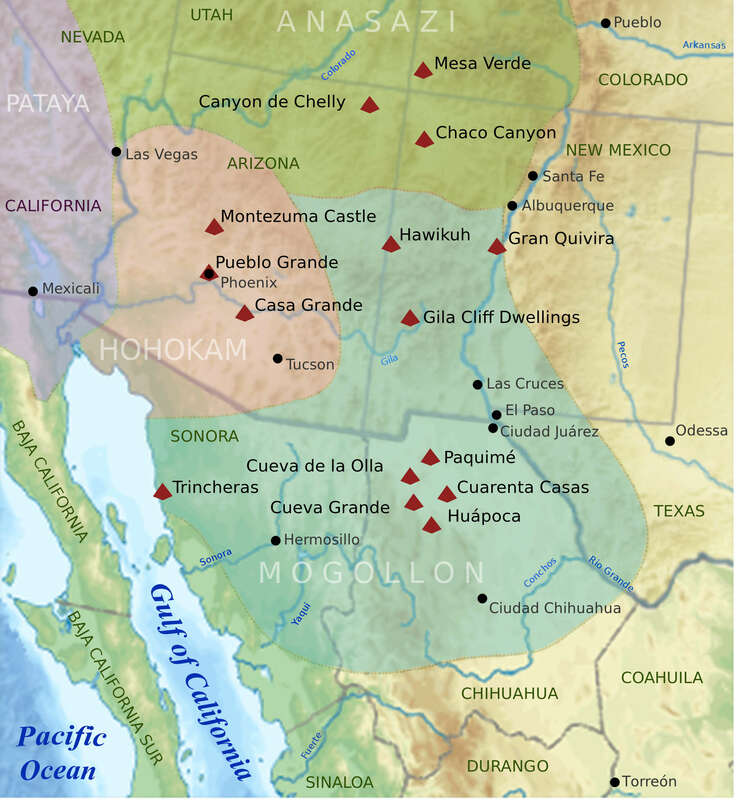 All the early cultures of the Southwest: the Mogollon, Hohokam, Salado, Sinagua and Anasazi, made pottery. 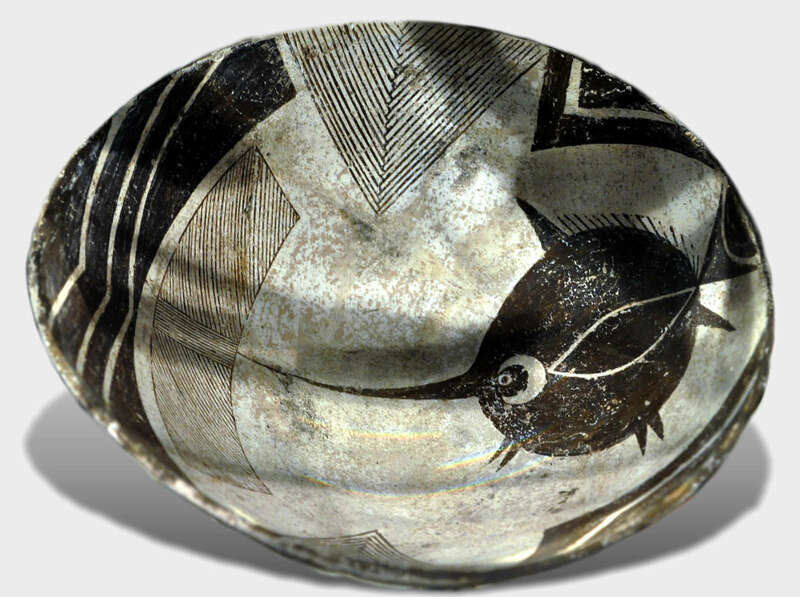 Archaeologists are pretty certain the modern Puebloan potters are descendants of the Anasazi, although 600 years ago there was an influx of Mimbres and Salado potters into the newly forming Rio Grande pueblos as those former homelands were being abandoned. Techniques such as slipping and painting a vessel were well developed 800 years ago and have changed little even today. A lot was forgotten when the Euro-American pioneer push westward nearly destroyed the art of pottery-making in the pueblos. Cheap and easy-to-use glazed vessels and metal cookware became available in quantity to the Puebloans when traders and then the railroads began to infiltrate the Southwest in the 1800's. Thankfully, Puebloan pottery is not now (nor likely ever was) a purely utilitarian item: in the pueblos, pottery has a spirit. It is a product of Mother Earth and her body forms the vessel and her bounty provides both the paints to decorate it with and the very need for creating the pottery in the first place. The children of Mother Earth who create pottery are aware of that spirit in the clay, in the paint, and ultimately in the synergy of the created vessel itself. In the traditional way, there are songs and prayers to accompany each step in the process of creating a sacred pot. It is the awareness of this spirit that kept pottery-making from being lost completely in favor of lesser spiritual quality but more durable and efficient tools. While the Puebloans were treated brutally by the Spanish and their priests, enslaved and forced to convert to Catholicism, their religion and their culture was not completely stamped out. Their spiritual practice, their language, their culture went underground and all have endured nearly unchanged over the centuries. When the United States wrested the Southwest from Mexico in 1847, they largely ignored the pueblos as the pueblos were seemingly not as warlike as the nomadic Apache, Comanche, Kiowa and Navajo and they didn't terrorize homesteaders and settlers like those tribes did. 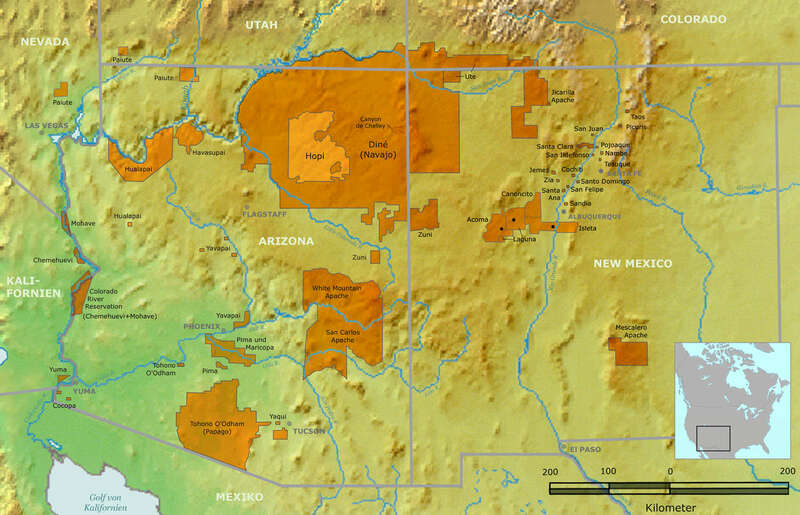 It's only in the most recent decades that the Puebloan culture has been truly threatened. As tiny islands in the seas of alien cultures, the Pueblos are finding their youth less willing to learn and speak their native tongue, less willing to learn the traditional techniques of making a living from the earth, and less willing to learn the complex and morally strict rites of the kivas. Despite this trend, Native American Pueblo pottery-making is in the middle of its greatest renaissance. The arrival of the new Euro-Americans created another function for pottery as it became a salable commodity on a scale never known before. The basic beauty in the shapes, forms and decorations of Pueblo Indian pottery was not lost on the new settlers and traveling Easterners. Potters found the market for their wares growing in the twentieth century, but they had to get past the impression made by the quickly made and poorly painted “tourist pot” of the early twentieth century. The "tourist pot" had come about as employees of the railroad barons solicited the potters of Acoma, Zuni and Hopi to churn out thousands of pieces of decidedly inferior quality. The art of pottery-making declined to being a basic mechanical function in the pueblos and soon, even the highest quality, well-made pieces themselves sold for next to nothing. 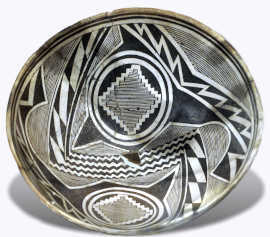 It was individual traders who personally encouraged the potters to make more pieces of the quality of the vessels normally used in Pueblo ceremonies. The early traders were always the buffers and liaisons between the cultures and they played a tremendous role in cultivating general American appreciation for Native American art. Before 1950 very few Native American potters signed their work. In their own communities, the forms and designs of their pieces made identifying the work of a master potter easy. Regionally, traders, collectors and museums also learned to differentiate these pieces. In the twentieth century benefactors from each of these categories organized a campaign to make the artistry and beauty of these vessels and their creators known to the world. Formal judging contests such as the Gallup Intertribal Indian Ceremonial and the very prestigious Santa Fe Indian Market that awarded ribbons and prizes for exceptional artistry began to have an impact. The early success and recognition of San Ildefonso Pueblo potter Maria Martinez at the St. Louis, San Diego, & Chicago World Fairs began to open the door for other exceptional Native American potters. 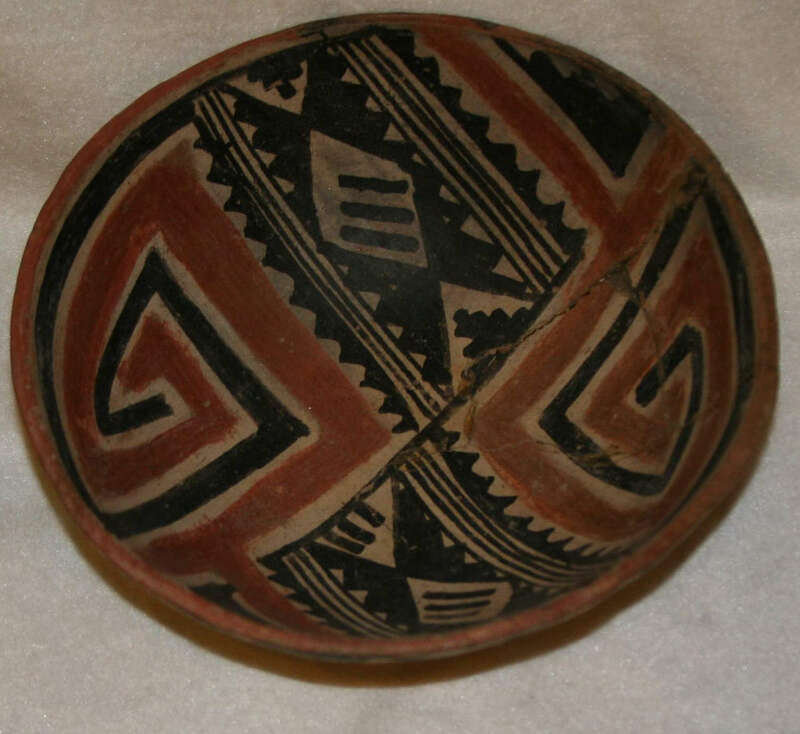 In the last decades of the 20th century the art and names of Pueblo pottery artists like Maria Martinez, Lucy Lewis, Christina Naranjo, Fannie Nampeyo, and Margaret Tafoya became known worldwide. Modern exhibitions like the Seven Families in Pueblo Pottery, permanent recognition in important museums around the world, and the marketing techniques of the traders and other Native American arts dealers has further cemented these names and the names of many, many other fine and deserving potters, both historic and contemporary, in the annals of art history. PS: As I lift my eyes to the horizon (from almost strictly Puebloan pottery) I'm discovering that pottery has been produced by many different Native American tribes. The distribution is from one end of the continent to another. That said, most lost their pottery traditions long ago, often in the periods of disruption following the invasion of Euro-Americans and the ensuing upheavals and forced migrations.